It Saturday and that means it’s day 6 of the Indie Book Collective’s “Get Loaded” Blog Tour de Force event. The next stop on the tour is over at the blog of author Ann Charles (click for your chance to win some kick a** swag!) and her winning book Nearly Departed in Deadwood, book number 6 on this exciting blog tour! If you think the title Nearly Departed in Deadwood is an intriguing title for a book, well you would be right! Not only has this book been declared as the 1st Place National Winner of the Daphne du Maurier Excellence in Mystery/Suspense award, it’s been hailed as being a 5 star read with elements of romance, comedy, and a dash of the paranormal, and of course mystery and suspense! Does it get any better than that? “Little girls are vanishing from Deadwood, South Dakota. Fearing her daughter might be next, single mom, Violet Parker, is desperate to find the monster behind the abductions. 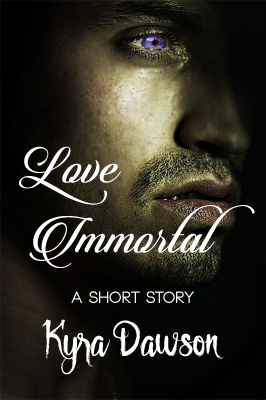 With her savings dwindling and just three weeks left to sell her first house or lose her Realtor job, Violet is ecstatic when a handsome jeweler hires her to sell his century-old, Victorian masterpiece … until she sees the dilapidated dwelling. Now, if she could just convince her only buyer to stop rejecting vintage homes as if they’re haunted. 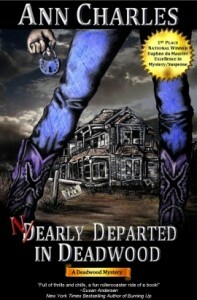 Nearly Departed in Deadwood marks the debut of author Ann Charles, and is the first book in the Deadwood Mystery series so don’t miss it, or will you will be missing out! Want to know more about Ann Charles? Check out the cool Q & A sesh over at Mark of the Stars! Ann Charles likes to hang out on Twitter @DeadwoodViolet and @AnnWCharles. You can also find her on Facebook, and Moonlight, Lace and Mayhem Mystery Isle where they will be interviewing Ann every Thursday during the month of January! And remember to sign up for the Blog Tour de Force newsletter which will also give you some ways to enter the Kindle giveaway contest and be the first to get Scavenger Hunt clues! Kyra, thank you for the warm welcome and helping me to spread the news. I'd love to give away a free book to 200 people today. I'm shouting from rooftops about the blog post, and I thank you very much for shouting with me here. –Ann C.
You are most welcome, Ann. Shout it from the rooftops and good luck with the tour!